Collaboration software costs largely depend on how they are packaged. These tools go in four major pricing models–free, monthly payment, annual payment and quote-based plans. Free plans are the cheapest option while monthly and annual payment packages offer allow users to use premium features without spending too much. Quote-based pricing, on the other hand, are employed for enterprise-grade collaboration tools, which can be customized according to users’ needs. How much does collaboration software cost? Are you on the hunt for a collaboration software providers but has yet to make up your mind whether or not to plunge into a deal? You may have heard of the benefits of such tools offer but are not sure how to go about purchasing one. Perhaps you have no idea how much these products go around for and you are unsure what price plan would suit your budget and organization. These uncertainties should not keep you from purchasing one as their benefits far outweigh their costs. For one, collaboration software are known to boost productivity by allowing companies to improve transparency, plan for crises, accelerate problem resolution and help employees acquire new skills. Software-as-a-Service or SaaS has been dominating the collaboration app market, mainly due to the pricing strategies that vendors use. Among these are per user pricing, where you pay varying amounts depending on how many people will use a system. There is also tiered user pricing where the increase in the number of users come in bands rather than individual. You can also go for subscription pricing, a system where a vendor charges a straightforward price for all services. However, four pricing methods have proved to be the most resilient ones in terms of adoption. These are the plans that come for free, those with monthly payment, annual payment, and quote-based pricing. Now, investing in such systems without knowledge of pricing information could be disastrous in the long-run. Imagine having to pay for a tool, which is no more than a brick when it comes to being useful. The thing with knowing the price tags that come with these products is that you get to choose the best deals available. This way you not only get what you need but also enjoy more value for your money. Purchasing software is a lot like buying anything from groceries to cars. The only difference is you do not always get what you see. This is why it is always a good thing to have an idea of how much these systems cost. And this is what this article is all about. Here we will seek to answer the question–how much does collaboration software cost? There are more than just a bunch of collaboration software platforms in the market that come for free. These systems come with all the basic tools that you need from such a system. They are a great option if you need to collaborate but has little or no budget to invest in an expensive solution. Many vendors offer free versions of their products. Albeit many of them are not completely free of charge, there are also freemium software that you can use absolutely for free. Wrike. Essentially a project management platform, Wrike sports a collaboration feature that is very useful to creative teams, helping them keep in touch with their creative flow. This effectively gets rid of complex administrative problems that come with lack of communication. You can send requests that can start the creative process, which can be distributed through URL, allowing even non-users to access them. Content becomes easily understandable as Wrike supports file uploads. You can easily sign up for a free Wrike account here. Zoho Projects. Zoho Projects is a powerful project management and collaboration tool that is designed to help teams meet both project budgets and deadlines. The milestone mapping tool that comes with the software supports collaboration among your team members. You can use a number of channels to collaborate with your team, among them, chat, forms, activity streams and feeds. They help ensure that team members are always on the same page while allowing them to contribute to your pool of ideas. Should you want to investigate the platform firsthand, you can easily do so when you can sign up for the Zoho Projects free account here. Bitrix24. Robust collaboration software Bitrix24 is a platform that is designed to help users in management, communication and collaboration tasks. It is a total collaboration tool, able to handle your projects, tasks, files, messages and even contacts. All you have to do is sign up for an account and send invites to your team members. Its free plan includes features that easily help team members collaborate, among which are file sharing, sales team management, CRM, document management, planning and HR management. It is mobile-optimized, making it accessible via iPhone, Android and iPad. Collaboration software solutions that are sold on monthly payment basis let you enjoy collaboration features without spending a fortune. Requiring you instead to make monthly payments that are light on the purse. What’s good about this pricing scheme is that you can cancel your subscription anytime you like. This is great for companies who want to use premium software without spending too much. But make no mistake, they are not the cheapest premium software around. Annual subscription plans offer much lower-priced plans. ProjectManager.com. A cloud-based project management solution, ProjectManager is a project scheduling and planning tool and collaboration software rolled into one. Aside from its project management features, ProjectManager is known for its collaboration functionalities, helping project team members stay on the same page. You and your teammates can boost communication by setting up group discussions, chatting and discussing projects online. You can easily sign up for a ProjectManager free trial here and get to know the features firsthand at no cost and without commitment. on online timesheets. ProjectManager is being sold in a variety of pricing models. Its Personal plan comes for $15/user per month. A Team package costs $20/user per month while its Business plan can be purchased for $25/user per month. ActiveCollab. Fully-featured project management and collaboration platform ActiveCollab is designed to provide you with the ability to manage tasks, billing and track time. It comes with organization and planning tools needed to automate as well as streamline your processes. You can also enhance collaboration and communication with team members, helping them keep their eyes on important tasks while getting rid of the need to search your email for critical data. You can communicate with others in real time, share files and post notes for any project. You can use all the features for free for a period of time to see if the software matches your needs. Simply sign up for an ActiveCollab free trial here. ActiveCollab is available in two pricing schemes. Its web-based plan comes for $7/member per month while a self-hosted model costs $999 one-time payment. Smartsheet. Web-based collaboration solution Smartsheet is designed to help businesses with team task and project management, sales pipeline tracking and crowdsourcing while helping them improve collaboration. It basically functions as a spreadsheet, making it easy to use but can be customized and is more powerful. It changes the way teams collaborate on tasks like event planning, marketing campaign tracking and operations management. Its intuitive interface does not require users to possess technical knowledge and can streamline the way you communicate and collaborate with relevant parties. Smartsheet’s Standard plan is being marketed under two pricing models. An Individual plan comes for $14/month while its Business plan comes for $25/user per month. Collaboration software being offered on annual payment plans are perhaps those that provide the greatest value for money as you can avail of these platforms at greatly discounted prices. These plans give you more flexibility when it comes to managing costs, resulting in more savings. Vendors also do not impose minimum terms, allowing you to access their systems for the entire period that your payment covers. You also get to enjoy updates for the whole duration of your subscription. However, should you find a system wanting in features, you are bound to be stuck to the tool until such time that your subscription expires. Zoho Forms. Although primarily an online form building tool, Zoho Forms is also a great collaboration software. Using the solution, you can build or gather forms from across a variety of platforms, systems and applications, which can be shared with colleagues. It stores forms in the cloud, making them easy to access for anyone in your team. It reinforces your collaboration efforts by helping employees work on projects through sharing forms, resulting in huge savings from communication costs. If you want to know more about the features you can easily sign up for a Zoho Forms free trial here. Zoho Forms is available in four annual pricing models. Its Basic plan comes for $8/month, a Standard package can be purchased at $20/month while its Professional plan costs $40/month. For those who want premium functionalities, its Premium package is being sold at $80/month. Monday.com. Formerly Dapulse, Monday.com is a popular communication and collaboration app that helps your team keep all their data in a single location, which can be accessed by anytime, anywhere. It also helps you keep tabs on project progress so that you get to deliver them on time and on budget. Collaboration is improved as team members get to hold discussions whenever problems pop up. You can comment on task updates, post queries and even initiate discussions. File sharing is also supported so that you get to contribute to the flow of information exchange. Should you want to investigate the platform firsthand, you can easily do so when you can sign up for the Monday.com free trial here. Monday.com is being marketed in four annual pricing schemes. Its Basic plan costs $25/month. A Standard plan, which is the most popular one comes for $39/month while a PRO package is being sold at $59/month. Its Enterprise plan, meanwhile, can be purchased for $118/month. pCloud. Web-based file storage solution pCloud helps users manage files and folders in the cloud. You can access the platform from laptops, desktops and mobile devices. The tool helps team members handle different kinds of projects by making file and folder searches much easier. These can be shared with relevant parties as the system comes with a file sharing feature, boosting collaboration in the process. You can create links to send files into a public folder, which can likewise be accessed by anyone in your team. pCloud can be purchased in two distinct pricing models. Its Premium 500 GB plan comes for $5.48 per year while a Premium Plus 2 TB costs $107.74 per year. Designed to provide users with custom features, collaboration software that are marketed under quote-based plans involve offering estimates based on a business’ requirements. This is pretty good for prospective buyers as they get to choose only the features that would go with the system. So if you’re planning to buy such tools, make sure you tell the vendor everything you need and want from such a platform. ConnectWise Manage. ConnectWise Manage is a project management tool that comes with robust collaboration features. The app is meant to boost staff accountability across teams. It does this by managing project assignment and management, boosting customer service and helping in strategic planning. It also remarkably improves communication, making sure that all team member are aware of critical updates. You can use all the features for free for a period of time to see if the software matches your needs. Simply sign up for a free ConnectWise Manage trial here. ConnectWise Manage pricing is not publicly available on the vendor’s website. You must contact the vendor and ask for pricing information. Slack. Popular messaging platform Slack is designed to improve your collaboration efforts by offering features like file sharing, messaging, searching and archiving. It caters to the requirements of today’s teams, giving them a singular platform by which to carry out all their communication. Using Slack, you can share files both externally and internally with anyone. It is also mobile-optimized, supporting both Android and iOS devices so that you get to access the system anytime, anywhere. Slack has a premium plan called Enterprise, which is available on a price quote basis. Call the vendor for additional pricing information. Asana. Undoubtedly the most widely used project management software in the market, Asana helps teams keep their projects and tasks on track. This, while boosting collaboration. Asana allows you to monitor and follow up on tasks and projects throughout their different phases. It enables team members to report on the status of their work so that you can identify problems head-on and do something about them. File sharing is likewise supported as you can make a safe location in which to keep critical work. Asana is available in a variety of pricing plans, including an Enterprise package which can be purchased by quote. Aufait Intranet Starter Pack. Built for companies that are looking to collaborate in a virtual workspace, Aufait Intranet Starter Pack allows businesses to quickly deploy a feature-rich entry-level intranet solution. Discussion forums, centralized document repository, smart search, and other functionalities are available to enhance team efficiency and collaboration. As it is designed to boost employee engagement, the platform allows users to convey any business-related communications on any device. Users can also benefit from fast adoption, as Aufait Intranet Starter Pack supports existing licenses for Microsoft Office 365 and SharePoint. Contact the vendor directly to get a quote. And we’re done here. 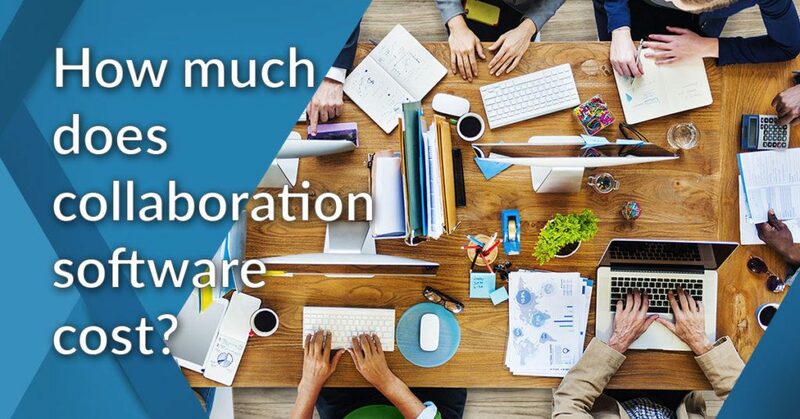 We have answered the question–how much does collaboration software cost? By now you should have a pretty good idea how much these tools go for and would probably think that you’re ready to commit to one. But don’t go straight into a deal yet. Remember that there are things that you should consider when shopping for one. And ever you feel that you need to know more about such tools, read our article on the best 20 online collaboration software tools. 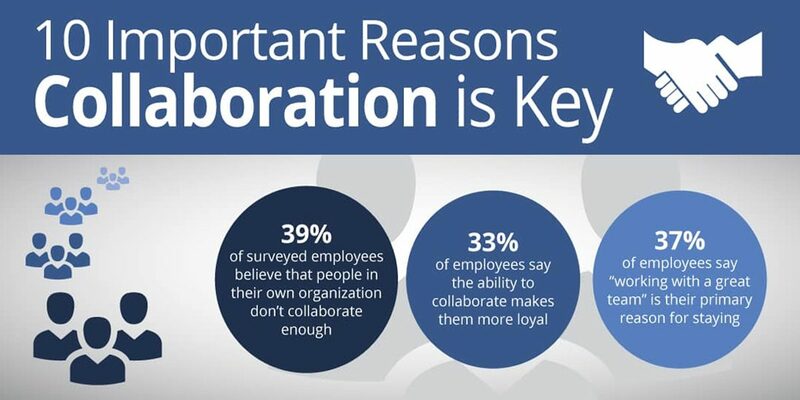 It will further widen your knowledge of collaboration platforms available to you. First, if you’re a small business owner, try looking for a free tool if you do not need premium features. But if you want more functionalities, you might go for monthly or annual subscriptions. If you are a member of a large organization looking for such a platform, the best thing to do is to make a list of all the features you want and inform the vendor about them. This way, you get to choose only the functionalities that you need.